Trefeddian Hotel with its panoramic views overlooking the Mid Wales coast, is just half a mile from the charming village of Aberdovey. The Trefeddian Hotel is a perfect retreat for families, walkers or visitors just looking for peace and quiet to relax and unwind. You'll find the hotel sun terrace the perfect spot to take afternoon tea or just sit and watch a spectacular sunset in the evening. The hotel facilities include an indoor heated swimming pool, tennis court, nine hole putting green, indoor and outdoor play areas for children and snooker room. For guests wishing for a little pampering, the in-house health and beauty salon offers a wide choice of massage and beauty treatments. There is also wi-fi internet access throughout the hotel. The hotel has four floors with a wide choice of sea view or hill view bedrooms. There is a lift to all floors and many bedrooms also have the added bonus of private balconies. The ground floor has four lounges where guests can relax and admire the sea views. Fantastic traditional cuisine is served in the hotel dining room from breakfast through to dinner and chef aims to please many diverse tastes, using expect fresh local produce wherever possible. An impressive 5 course table d' hôte evening menu is complemented by a fine selection of wines and friendly service. Explore the unspoilt beaches and landscapes of Southern Snowdonia, and the UNESCO Dyfi Biosphere area, this really is a wonderful place to visit for people of all ages. 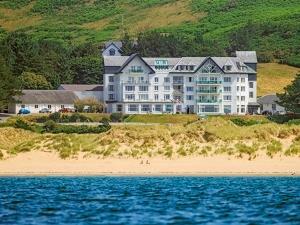 The hotel overlooks Aberdovey's 18 hole championship links golf course and beyond are 4 miles of clean golden sandy beach. Aberdovey village is charming and has many boutique shops and galleries to explore. A variety of water sports such as sailing, canoeing, fishing and boat trips can be found around the harbour. Nearby in Tywyn there is the famous and renowned Talyllyn narrow-gauge railway. The Centre for Alternative Technology, Corris Craft Centre and King Arthur's Labyrinth are all near by in Corris and provide an interesting day out for all. Access Statement available upon request.